According to a recent article in The Economist (March 10th – 16th, 2012), a recent constructed series of data by Emmanuel Saez shows that on the eve of our recent recession in 2008, “income gaps reached extremes last experienced in the late 1920s. The top 10% of American earners brought in 46% of the nation’s salary income in 2007. The top 0.1% earned over 12% of all salary income. 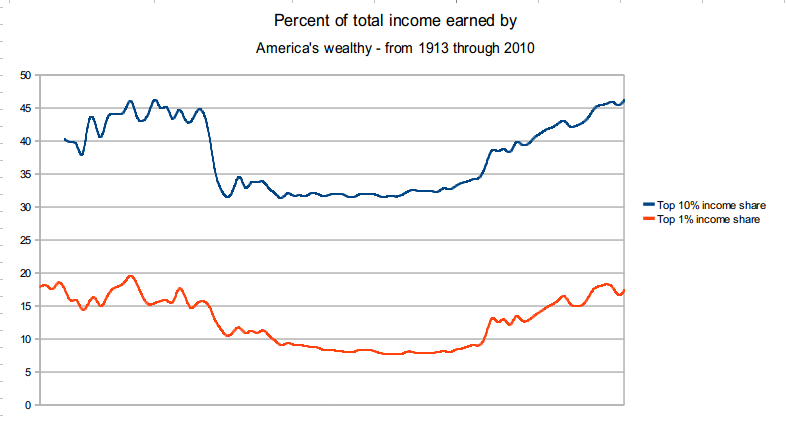 Although the recession took a heavy toll on the rich, it also took a toll on the lower 99%. Inflation adjusted income for the 99% dropped by 11.6%, the largest decline since the Depression, while the top 1% suffered a drop of 36.3%. However, updated figures, through 2010, show that the top 1% of earners have seen a rise in income of 11.6% while the rest of the workforce a gain of 0.2%. The reason for the quick rise in income for the rich is due to the declines in high incomes during the recession being tied to stock prices. As the market rebounded, so have incomes. By contrast, salaries have barely budged. Previously, after the Great Depression, regulatory and tax changes that followed made the lasting impact on income distribution. We are less likely to see something similar follow due to the aggressive campaigning on increasing taxes and regulating securities. Below is a graphical representation of the percent of income earned by the top 1% and top 10% wealthy Americans. I think at this point some of us are left to ponder, what event would offset this growing trend that can potentially create a two class system of haves and have not’s? Now, it’s logical to think and feel that the the proportion of income is representative of the capitalistic system we have in the United States of America. In fact, I share a similar sentiment. However, the problem arises when high income earners don’t pay into the system that helped them make their wealth. To keep this post short and simple, it is my belief that we should go to a flat tax system after a period of time where the wealthy are taxed at rates that will offset previous tax breaks adjusted for inflation. Then we can all begin on a more level playing field. In addition to that I would reform our fiscal policy that impacts barriers of entry into certain industries. But that’s another topic for another day. In closing, a message that I want to get across to my fellow middle income Americans is to become familiar with our tax code. Engage in the behaviors that will invoke tax breaks for you (e.g. start a business, make qualifying work purchases, invest in Roth IRAs, etc…). Put these economic behaviors in practice like you’ve put in practice healthier diets and exercise regimens. A mass shift in our economic behaviors and consumption patterns will force the government to begin distributing the social responsibility of taxation more evenly. To learn more about the world top incomes, visit the World Top Incomes database. This is not a post on how to personally file bankruptcy and get away with it, although I may be inspired to write about that one day. This article tells a story in the eyes of a speculative investor who invested in a company who he thought had potential despite all the company’s financial position. Well, I’m making that sound a little dramatic but it’s pretty much true. A couple of years ago, I decided to write a post about purchasing stocks online. Growing up, the purchase of stocks was a mystery to me. I never fully understood where an individual could buy stocks. Scottrade, E*Trade and ING Sharebuilder were never around. They gradually starting appearing when I was in college. Years after I graduated I decided to look into that aspect of investing a little further. That’s when I opened an account with ING Sharebuilder and made three purchases. One of my purchases was Java. It took a few months before I stopped logging in periodically to check gains and losses and shortly after I completely forgot about my Sharebuilder account. That is until I heard that Oracle had bought out Java. Well actually I still didn’t access my account until a couple months after to see what had happened to my stock. The result was a cash buy out that netted me a loss but a few extra bucks (less than $20 I think). So the money was deposited into my Sharebuilder account. I could either withdraw it or repurchase another stock. So shortly after I bought Blockbuster for $0.04 / share. I thought if it ever reaches 50 cents or even a dollar; Money well spent!. At that point Blockbuster was trading as BLOAQ.PK (penny stocks/pink sheets). They advertised this ticker on their website (Blockbuster.com). Blockbuster has been an icon in movie rentals, I said to myself. Despite all the other competition, it’s possible that they’ll ride this out and prosper in the future. Well prosper they might. After all DISH network bought their assets, business and their brand, “Blockbuster”. You can read the SEC filing here: http://xml.10kwizard.com/filing_raw.php?repo=tenk&ipage=7834744 or view the excerpt below. So where does this leave the Original Blockbuster, its creditors and equity holders? Well Blockbuster was able to continue being a going concern eventhough DISH essentially purchased a company. DISH was able to do it without also absorbing their liabilities. In addition to that, since DISH did not purchase the stock of the company, the former Blockbuster still remains, although in reality it’s just a shell of a company. There also doesn’t seem to be any real value behind it. So as a result, the SEC halted trading on BLOAQ stock. The former Blockbuster is now BB Liquidating Inc. Whatever creditors they had are now sh*t out of luck. And of course investors that had a gleam of hope for the company, well they’re stuck with worthless stock that may not be worth the paper it’s certificate is printed on (regardless of the number of shares). So as of today, below is a snapshot of the value of my 227 shares of BB Liquidating Inc (formerly known as Blockbuster) stock. =) Lesson learned. Aderogyl 15 - Ingestible Solution. Strengthen your defenses. Treatment and prevention of influenza and common cold.